The evening was really lazy. The Gods of Weather gave us great 30°C (86°F) in the shadow during the day and the sunset was phenomenal! That's a great thing living so much north at the 50th latitude. The sunsets last for ages and it takes ages until it gets really dark. The beautiful blue hour makes it possible to sit until 9.30 PM on the balcony without the need of a lamp. Four weeks ago it was 9.30 PM when the sunset started, now... anyway that's the circle of life. It won't take long the leafs on the trees will become dark red and yellow and later again I'll be singing "Going home for Christmas", when I'll pack my stuff to visit my parental home. We get older, we get mature, we love, we hate, we lose, we die. People will come, people will go, they will be parts of our life and disappear. C'est la vie. It always worked this way and that's something we have no influence on. When I was watching the blue sky I was asking myself "what if there is some life, there, somewhere, over me?". Is it possible that we might be not the only creatures in the infinity of the universe? Do they have the same thoughts we have, do they fear the same things, do they see the same sun and stars we can see? It's so amazing. I wish I would know the answer to my own question. Imagine, somewhere in the universe there's someone who can see the same things we can see and we even don't know that those one exists. 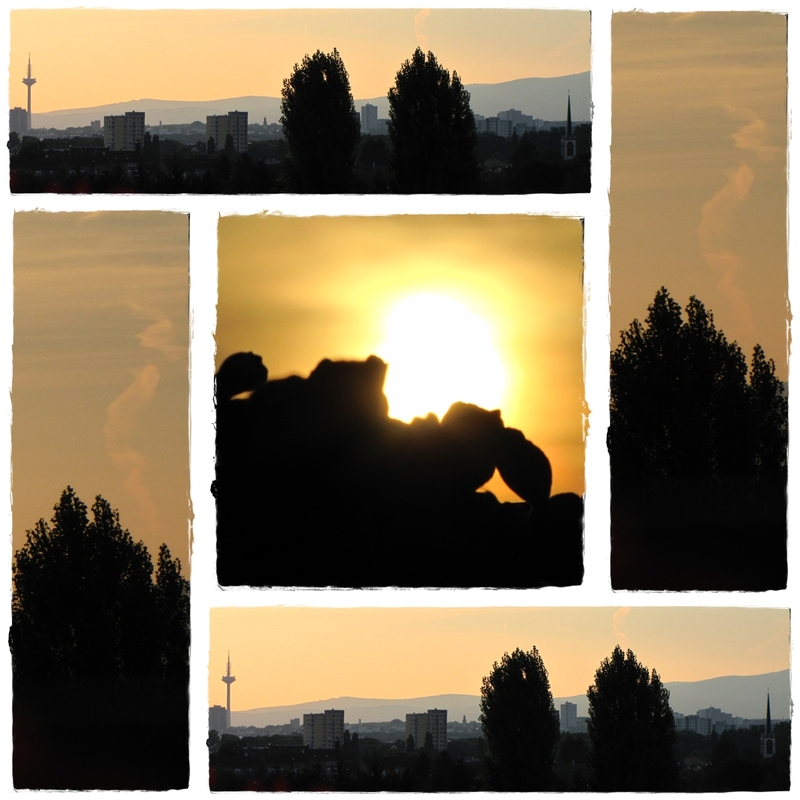 Maybe there's somewhere someone who watches the sunset and thinks: "is it possible that there's other life somethere?". I would answer: "There's a Blue Planet called Earth". But he wouldn't hear me as we can't hear them. 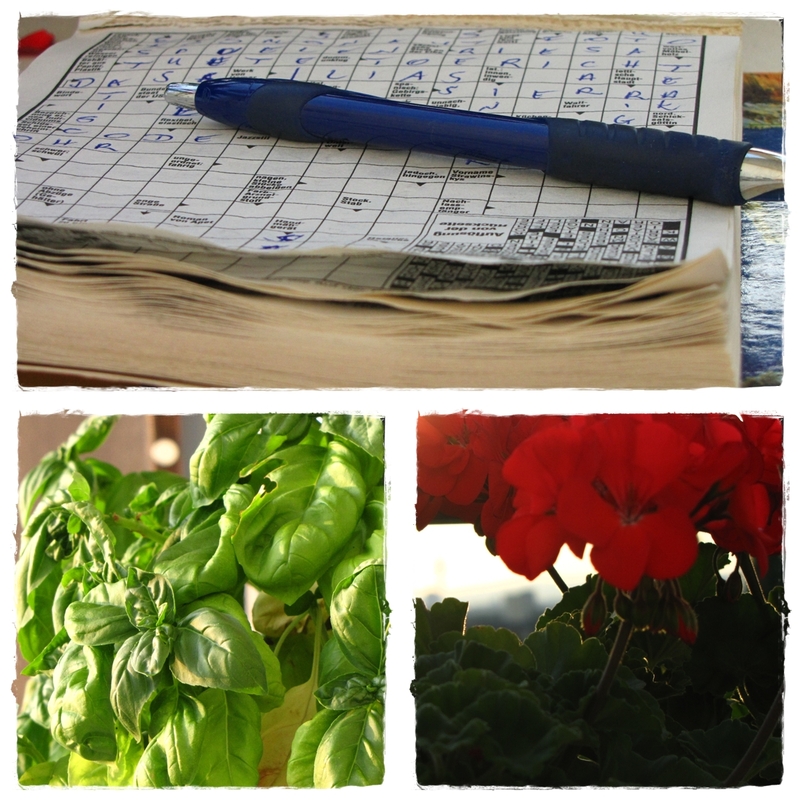 When I saw my balcony today, I saw my poor crosswords I forgot two days earlier. And because we had some rain the night before and the Westside is always the rainy one here... I dried my crosswords. On the photos they look better than in reality - the exactly opposite of me. I am totally crazy on doing crosswords. I always was. In the bus or in the underground, on the plain or in the train. Books and crosswords, crosswords and books. In the last time I was doing them every evening before the sunset and I could improve my own record. It takes me exactly 6 minutes for one. 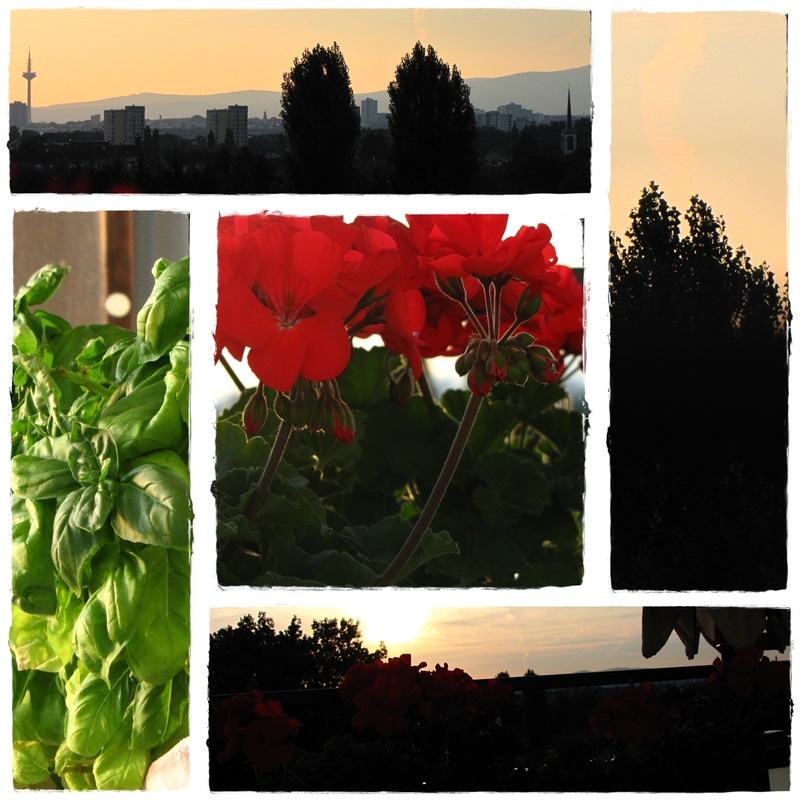 Here are some pictures I took in the evening sun - 1) something is eating my basil. I don't know what but if I'll catch it.... and 2) I wish I could take really good pictures. I am the world's worst photographer and 3) no cooking today, I'm still eating that ratatouille from yesterday.